A replacement pancreas for a mouse has been successfully grown in an animal of a different species, Japanese scientists announced this week. Worldwide, demand for organ transplants outstrips supply by a factor of thousands. Just in the US nearly 100,000 people are on donor organ waiting lists. Now researchers in Japan have opened the door to a potential solution, by showing that it's possible to grow a new, genetically compatible organ in an animal of a different species and then transplant it into a recipient to treat a disease. The discovery is described in a paper published in the journal Nature. Diabetic mice were given replacement pancreas tissue grown in rats, reversing their diabetes for over a year. To achieve this, Tomoyuki Yamaguchi and his colleagues injected mouse stem cells into developing rat embryos. This produced embryos known as "chimeras" in which the tissues were a mixture of mouse and rat cells. Critically the rat's own DNA had been genetically edited to deactivate a gene called Pdx-1. This is the master switch that controls the development of the pancreas, and so the removal of this gene prevents the rat cells from turning into pancreas cells. But the injected mouse cells still have a working Pdx-1 gene, so the pancreas that forms in the rats is made up almost exclusively from mouse cells. Why almost? Because the pancreas also contains blood vessels and these still contain rat cells. 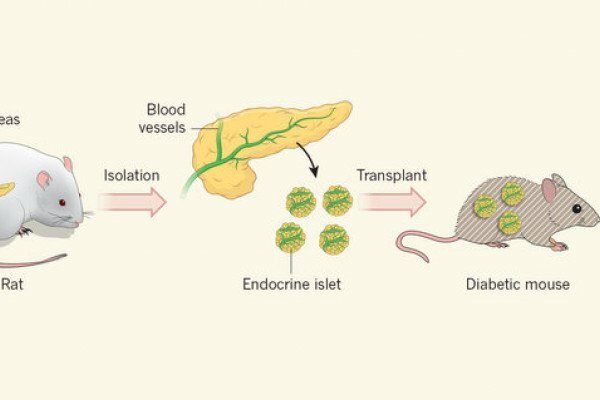 Next, Yamaguchi and his team then isolated the insulin-producing "beta" cells from the pancreas tissue and implanted them into mice with a form of diabetes caused by the loss of their own pancreatic cells. Other than administering a short 5 day course of immunosuppression to their mice to guard against immune rejection of any rat blood vessel cell in the transplants, the recipient mice received no other treament. Nevertheless, their blood sugar levels returned to normal and remained well-controlled for over a year following the transplant. This demonstrates that "interspecies organogenesis" as the technique is known is theoretically and practically feasible. "You can see how, in the future, this could be translated to humans," says Harvard stem cell biologist Qiao Zhou, who wrote a commentary on the work, also published in Nature this week. "But this is a long way off." The reason for Zhou's cautionary note is that the present experiments were made simple by the knowledge of the Pdx-1 gene, which single-handedly deactivates the formation of the pancreas. Other organs will certainly not be so simple to manipulate. "The eventual aim would be to grow human organs in pigs or sheep. But major technical challenges lie ahead, like rejection of human organs by the host animal's immune system," warns Zhou. Why does overeating chocolate make you feel sick?